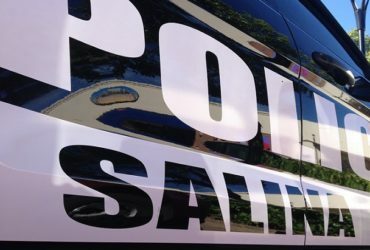 Four people were transported to the hospital in Salina after an SUV veered off Interstate 135 and crashed following a wild ride. According to the Kansas Highway Patrol, 54-year-old Mark Womacks from Atlanta, Kansas, was driving a 2016 Chevrolet Suburban headed north on I 135. The SUV left the road and veered through the median into the south bound lanes where it hit an oncoming 2008 Dodge pickup truck. After hitting the pickup, the Suburban left the road again. It continued west up a hill and through a Kansas Department of Transportation fence. It then went down a hill, hit a large bump vaulted into the air, and finally came to rest right side up. No one in the pickup which was hit was hurt. The crash happened at around 7:45 Saturday morning on Intestate 135 in McPherson County near the Smoky Valley Road exit.